What did you think of the full-length ballet adaptation of Mary Shelley's gothic masterpiece? @TheRoyalBallet @RoyalOperaHouse #ROHfrankenstein The best production I have ever seen at the wonderful ROH. The audience were GASPING. WOW! #ROHfrankenstein beautifully bleak,gorgeously gothic depiction of grief & misunderstandings.Sometimes Scarlett makes it look too damn easy! General feeling on #ROHFrankenstein: good but could be much better. Doesn't delve into the reasons why the creature does what it does. #ROHfrankenstein made me want to read the book. It tells it's not just about blue coloured stitched up monster. It's a moving and sad story. WOAH!!!!! Incredible first act. Liam Scarlett is the modern day Macmillan. I'm mind blown #ROHfrankenstein #Genius this is so exciting!!! Enjoyed the drama of #ROHFrankenstein this evening - a proper story-telling ballet - not perfect, but a big step in the right direction. Frankenstein runs until 27 May 2016. Tickets are still available. The performance will be relayed live to cinemas around the world on on 18 May 2016. Find your nearest cinema and sign up to our mailing list. You can also watch Frankenstein, live and for free, in selected towns and cities across the UK on 18 May 2016 as part of the 2016 BP Big Screens performances. I thought it was largely a terrific evening in the theatre. Yes, of course, there were nods to Macmillan and others but all creative people are influenced by their forebears. I went to the Insight evening and the detail that Liam Scarlett put into his choreography was incredible. It's online here - watch it. All is can say is that I invited a friend last night who had never seen a ballet at the Royal Opera House and he was transfixed and on a complete high after the first night. I just don't understand how the Telegraph reviewer can give it just one star. Were we at the same show? I really enjoyed it, a fun evening! The ‘Wow!’ moments definitely outweighed the ‘Really?’ moments. I’m sure it will be a monster hit in the cinemas, can’t wait to see it again on the big screen! I was at the rehearsal earlier in the day and I thought it was great although I had not been sure whether I would like it. I have not booked a performance this time but I shall definitely go to the cinema screening to see it again and book a performance in a future run. A truly brilliant evening. McRae as The Creature conveyed raw, moving emotion that created sympathy for his character. His performance portrayed the reasons for The Creature's actions very effectively. Perhaps some parts were filler, but it would have been hard to watch something as emotionally charged as Frankenstein without being absorbed in beautiful, joyful dancing at times. The orchestra also deserves credit - music and dancing went together perfectly; William's playful interaction with The Creature and the way the game turns into something much more sinister built on the orchestra especially successfully. Very impressed with Sarah Lamb and the way the production combined poignancy with horror, but why wasn't this scheduled to coincide with Halloween? It would probably have attracted a bigger cinema audience then. Just got home from seeing Frankenstein with second cast. I was initially disappointed not to be seeing Marianela and Vadim , but pleasantly surprised by how good both Tristan Dyer and Nehemiah Kish were. Great to see Nehemiah in a dramatic role. Sarah Lamb lovely as ever and Francesca Hayward and James Hay dance beautifully. Now I want to see it again! Although Scarlett's Frankenstein received mixed reviews from the press, there was one thing they all seemed to agree on: that this production had completely diminished the role of the monster, and instead focused on its creator, Victor. Perhaps this is why spectators thought something was amiss in this version of Shelley's gothic masterpiece; Scarlett's rendition was not entirely true to the novel, or to the established depictions of the monster. If Edward Scissorhands was expected, we were handed an Alien mutant in his place. But this is deliberate. Scarlett specifically wants to distance us from the creature, so as to de-humanise him. For instance, he receives very little stage presence, his movements are unnatural, and his costume is repulsive. He is also listed last on the cast sheet, and, at the end of the final act, he walks away from the audience, rather than towards us. All of this serves to detract any empathy we may have for the monster. It is as if Scarlett is asking us not to identify with the monster, because he is murderous, abnormal, and most importantly, not human. Rather, our humanity should extend towards Victor, who is one of us. Just as Wheeldon chose to present a revamped version of Cinderella - one where Cinderella's role is de-centralised - here too, Scarlett offers us a fresh interpretation of Shelley's classic. This is not a shortcoming; in assuming that there was some error on the part of this very young choreographer, we have grossly underestimated his talent. Like Alice and Winter's Tale, this is an exquisitely designed and executed show, with fine choreography, touching music, and magnificent stage production. There were moments which had the effect of a cinematic blockbuster, such as the lab scene and the hanging, which had audiences gasping. Meanwhile, the creature came across as a comic book villain of sorts, such as the dark Spiderman, which also hinted at the interplay between cinema and theatre. But the final act was too abstract when compared with the action packed first and second acts, which had the effect of depreciating the overall impact of the show. Perhaps Scarlett is too accumstomed to creating one act ballets; there is a real need to enhance Frankenstein's climax so that it outshines the introduction. In doing so, the show will retain the magic of the earlier scenes, and successfully seal the metamorphosis of this very English legend. saw the final rehearsal and unfortunately it did nothing for me.. there was little atmosphere, I don't think the music and dancing were overly inspiring or dramatic. Lamb just did not seem to get into the part. The monster was prob the highlight and the scene at the end but not one I would want to see again and did not live up to my expectations at all..
Was really surprised by the lukewarm and poor reviews for this (1* from the Telegraph!) Caught the matinee yesterday with the second cast (Tristan Dyer, Sarah Lamb and Nehemiah Kish) and we loved it. The complaints largely seem to be about an overly literal following of the novel and in the first act there are a few cuts that could be made (why is the scene to mother's grave necessary?) but the second and third acts soar. The pairing of Dyer and Lamb is magical - their pas de deux were exquisite, technically beautiful (one lift that Dyer accomplished from a kneeling position was breath-taking) but more than that they are both actors. I've never seen Dyer is a principal role before and he is a real find, beautifully conveying the nuances and conflict of the character. You don't want to take your eyes off him. Scarlett doesn't just cling to the novel - the blind man's family is excised for example, effectively replaced by a Blind Man's bluff game at William's birthday party leading to his encounter with the Creature. The final encounter between the creature and Victor is a powerful pas de deux combining a fight to death and a loving recognition of each other. At one point, they hold each other's faces, at another the creature puts his head under the arm of the prone Frankenstein like a child might to his father. Elizabeth and Victor's wedding is a beautiful and haunting danse macabre with the creature appearing in an elegant coat amongst the Gothic inspired celebrants, a creature of Victor's imagination. We enjoyed this as much as The Winter's Tale, which we loved. Annie I absolutely agree with everything you said. Your review read far better than mine but I would have loved to express myself as well as you did. I attended the 7 May Saturday matinée and was blown away. Epic production, epic performances from the entire cast (principals to corps de ballet). Wonderful performances from Tristan Dyer, Nehemiah Kish, Luca Akri, Yasmine Naghdi, Sarah Lamb et al. In my opinion, only the Royal Ballet could have pulled off such impressive ensemble work. Congratulations to everyone (all supremely talented) involved. Despite the unjustified notices from some critics, with one particularly nasty individual, the audience that afternoon could not have cared less. The Opera House was FULL and the audience cheered the performers to the rafters! Perhaps the ROH should charge critics for attending performances? Who needs this bunch of an obsolete species? As for the principals who allegedly pulled out of their performances: shame on you! You are supposed to be role models not 'drama queens' who also happen to be on a salary funded by people, like your audience for a start. Totally unprofessional and a huge disappointment (if the rumour is at all founded). Looking forward to the triple bill on 28 May. I was there too and absolutely agree with you. Were the critics at the same performance as the rest of us? Judging by the reaction of everyone around us on opening night, (not to mention the enthusiastic cheers emanating from the rest of the house), I would say that Frankenstein was a triumph. We thought it was wonderful and are very much looking forward to seeing it again! First time of attending a ballet performance. I really enjoyed it. Each movement, as far as I'm concerned, contributed to the story. Has encouraged me to go to other performances. In your list of critics reviews you've omitted two 2 star reviews from experienced dance writers - Classical Source & What's on Stage. These have now been added, in addition to the 4 star review from the Express. Having not been at all keen on the idea of this when it was first announced, I absolutely loved it! It is just the sort of ballet I want to see, in fact, with beautiful, very classically-based, extremely musical choreography (with some wonderful pas de deux), fantastic sets, and gorgeous costumes (what wouldn't I give to have - and look as good in(!) - one of those sparkly dresses in the last Act?! ), as well as characters you can believe in and empathise with. Both casts that I've seen have been wonderful, and many of the scenes with the creature (in particular that when he is interacting with a blind-folded William) I found to be extremely moving. I also really liked the music (I always rather dread a commissioned score). I can't wait to see it again next week. A massive "well done" to all involved, but especially Liam for having the vision to pursue and create this. I hope this will be the first of many full length ballets from him, and I feel very privileged to have been at the first. Somehow disappointed: this ballet lacks of drama, tension, it is too much talkative (chiefly the 1rst act, mostly anecdotic and with poor dramatic impact except the spectacular last scene). However I do like the fact that the Royal Ballet gives a chance to a young choreographer to create a full-length. Any creator, any genius, needs to try again and again before creating the masterpiece that the history would later remember: therefore though I am disappointed this time I sincerely hope that the RB will still continue to propose creations of full-length on a regular basis, and that Liam Scarlett will be given other opportunities to show his talent. Perhaps narrative ballet is not his best universe? By the way, the quality of the performance was globally very good, as usual. This was imaginative and moving ballet with conviction in the narrative and sympathetic characterisation - some (minor) changes away from the Shelley book, but perhaps to be more visually effective and poignant on stage, and not offensive in its artistic license. There were several places where I came away almost light-headed from holding my breath or shallow breathing with the sheer tension and drama, not least the last ten minutes of Act 2. An incredible blend of traditional, gothic and modern touches, Frankenstein has the makings of a cult favourite - perhaps achieved already. Bravo! Brilliant. Breathtaking performance from Stephen McGraw. Alexander Campbell is a joy to watch. When will be be promoted to Principal Dancer? Took myself off to the cinema for the live screening of Frankenstien. I never go by the critics reviews but as others have mentioned, have we all been watching the same ballet? Brilliant, emotional, mesmerising, could go on and on. Costumes, lighting, props and the musical score,wow,all perfect for the production.As for the dancing,just splendid.Went home buzzing! I saw Frankenstein at the ROH last night and I really enjoyed it. I only heard positive comments from audience members around me too. Steven MC Rae was absolutely brilliant as Creature (his make up/costume was so effective and his interpretation wonderful) and the child performer cast as Frankenstein's younger brother was excellent. The scene between these two characters was the most poignant for me. The contrast between the safety and fun of the party with the little boy's lonely and horrifying death was so moving. I also really liked Victor's urgency and madness as he creates the monster (who I felt needed to stay on set a bit longer before running off). I loved the ball scene where the creature keeps getting lost in the crowd of dancers. The confusion and frustration was palpable and very well choreographed. The final dance between Victor and creature was very effective for me too, especially when they gripped each other's faces and stared at each other. So tense! More of this please! Of course, pieces could be cut out (the scene by the grave for example or the bawdy pub scene, some of the maids dancing and Elizabeth does too much chasing after Victor with concern. We know they love each other and she is concerned. Though important, too much time is spent revisiting this relationship). This would allow more time for the excellent creature to be on stage and to develop the all important feelings and relationship between creator and created. The creature's feelings of rejection and isolation from his maker could then be explored in more depth and more time given to exploring Victor's revulsion for his creation and his terror for his loved ones safety. Thus, this would build up the suspense to an even greater crescendo for the final tragedies- where again more time could be spent. The deaths came very quickly one after the other and it felt a little rushed. I wanted to feel really sad when Elizabeth died (I certainly did with the child and Justine died.). But I didn't. By this stage I was a bit irritated with her for all her running about after Victor 'with concern'. I wanted her to be more pro active in helping Victor with his torment. Why doesn't she get angry with him, cry, shout...why is she so passive and sad in her concern. Surely she wasn't so placid for 7 years. I wanted her to pick up the gun again and try to shoot creature. She was so close to the gun. We could have seen her nearly touching it, scratching at the floor towards it, almost there (will she/won't she get it?? )...and feeling her total despair when she couldn't reach the gun and knew in that moment all was lost. Overall, I thought this ballet was very intense and moving in parts with lots of interest and potential. I am so glad I've seen it. Unlike many contributors above - I had read no reviews before seeing the ballet last night at the cinema. I had no preconceived views. I found it totally spellbinding, could not take my eyes from the performances and in particular I felt the creature's portrayal of longing for the love and approval of his maker was both a triumph and true to Shelley's vision.The special effects in the lab. were brilliant and so too the costumes and make up. In particular McRae "became" the creature in every sense - his performance a stunning triumph. I read most of the reviews today and can only echo the comments about the critics above, some too personal to consider other than vicious. Who are these people anyway ? The job of a critic is to be objective fair and honest, the word spiteful is not within their job description. For those of you who are not sure about the ballet because of the adverse reviews - GO - see it - make your own mind up ! You will not be disappointed. We saw the 17 May performance and came with slightly lower expectations following the mixed reviews. Clearly the reviewers operate on a different wavelength, because we totally enjoyed the dancing and the story. The mix of humour, threat and sadness was beautifully conveyed by the performers, and Liam Scarlett should feel proud of his achievement in creating such a work which has brought so much enjoyment to us and many others. I had read reviews and was fearing the worst. The performance 18th May had a stellar cast and they and the choreography communicated mood and emotion. in crystal clear and powerful fashion. An accomplished production completely at odds with my preconceptions. With this production the ROH has moved forwards, I believe. My husband and I went to the direct transmission last night and thought it was a brilliant and very exciting performance of Liam Scarlett's Frankinstein. I have read the opinions posted above and totally agree with all the positive comments on this amazing work but disagree that Liam cannot produce a narrative ballet. Quite the opposite in my humble opinion! My husband is not as keen on Ballet as I am but he was captivated. The sets were stunning and I thought there was some excellent choreography in it. I was a little disappointed by the scenic portrayal of the last act, it didn't seem to fit with 1 and 2 but the narrative was brilliant. Many congratulations to all members of this wonderful creative process, a real triumph! I enjoyed the screened performance at the Bungay Fisher Theatre last night very much. I leave critical appreciation of the work to others. I have been going to live screenings more or less since they started. I realise that a live broadcast is not the same as being in the theatre but I found the relentless, fidgety editing/changes of camera angle, particularly during some ensemble sequences, very annoying and unhelpful to an overall view of the stage picture and the patterns that I assume the choreographer wished to create. As an audience member used to being in the theatre I can choose for myself where to look and screen director certainly has a role in directing our attention but this was very overdone. Some of the sequences from a particular angle could only have been a few seconds long. Could I also put in a plea to reduce the interval 'entertainment'? We like to talk among ourselves about what we are seeing and bar sales at local venues are just as important as they are at the Royal Opera House. I had the privalage of watching a screening of the performance in Street, Somerset. I was astounded by Macrae's seeming effortless ability to convey complex and subtle emotions through both movement and facial expression. The original story was powerfully retold for a modern world concerned with sciences growing ability to synthesise life and life-like systems. It may have been a peculiar feature of screening but the blank screen between scene changes disrupted the conceptual flow of the piece, because it seemed to represent the absence of consciousness of the 'beings' unawoken state of mind and thus didn't always fit with the scene sequence. I wonder if a projection of a variant on the Da Vinci like skull might have been helpful to maintain a default conceptual link? Brilliant! Congratulations to Liam and the creative team for an excellent new work. Have seen two casts and equally exciting both times. Cannot understand how negative some press comments were. Such a clever piece, and everyone I have spoken to agrees. I saw it twice at the eOpera House and I loved the good acting skills that brought out the narrative and the pas de deux sequences in every act.. The production was very good but the the gavotte in the first act anf the waltz sequence, both danced by the core, I found boring. The game of Blind Man's Bluff in the second act just went on for too long..
Sensational! This ballet will run for years to come. My husband never stays awake yet with this production he was completely hooked and energised. The costumes, set design and music are outstanding and portray the story, The choreography and the dancing are out of this world. McRae is amazing as the creature. Please let Liam Scarlett do more full length productions he is so talented and this proves it! Bravo!! I read the reviews on the train home last night and it felt like I'd been to a completely different ballet. Mostly, I suspect that reviewers didn't like that Scarlett has not interpreted the text as they would have done. Well, I went along to see somebody else's presentation of the Frankenstein story, not mine. As for unremarkable music: did they spend the evening listening to Justin Timberlake on their iPod? The mind boggles. I've lost count how many performances I've seen at the ROH and this was one of the most moving and engaging I can remember. My daughter and I saw this at The Odeon in Port Solent Hampshire: and thought it absolutely fantastic. The dancing was superior to any other I've seen. The story was much better and more dramatic than one sees in any of the films. To start with I thought the music a "bit iffy" but as it went on it told so much of the story along with the dancers. The two young lads who played Victor and William showed great stamina and are well set for their future careers as prime ballet dancers. All the dancers were exceptionally good but Steven McRae stood out from all the others. On Thursday I went to an elderly persons club and couldn't stop talking about it to friends. If it ever comes to this neck of the woods again I will be inline for tickets. Many, Many congratulations to Liam S. on this his first three act ballet. It was brilliant. Congratulations to everyone involved. I saw it in the cinema and there was a round of applause at the end. I was really disappointed to read the poor reviews given by a couple of the newspapers as I though this was one of the most powerful ballet productions I have ever seen. Although there were some disappointments; such as the lack of importance given to the death of Victor's mother and no explanation of the fire at the end, I thought the choreography and the music were phenomenal and McRae as the creature was exceptional. I thought the chemistry between Laura and Fredrico was fantastic although I did feel that maybe she was a little bit too old for him. The only part I wasn't over enthralled with was the scene in the Anatomy room which I thought too dramatic and fantastical with not enough ballet. I short, I was virtually speechless by the end which is really unusual. I go to as many RB and ENB productions as possible - the last was Giselle, which was the best ballet I've ever seen. I went with an open mind to this new ballet. I'm sorry to say I really didn't enjoy it. I felt I endured rather than enjoyed it. It just didn't seem to be up to the standard I've come to expect in terms of the choreography and dancing. Notable exception was Stephen Mcrae, whose dancing was mesmerising. I saw it at the cinema via live-feed and the atmosphere during the intervals was down-beat and the response mixed. I particularly disliked the grey 'curtain' effect during set changes, which was not pleasant to sit and watch. I'm sure Liam is a talented choreographer, but he has a lot to learn to reach the standard we have all come to expect of RB. 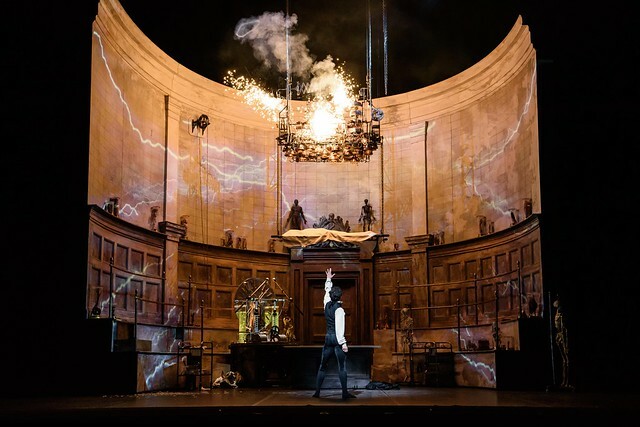 We saw the live screening of Frankenstein last week - and there was so much to admire and enjoy - it was a sumptuous production, with wonderful sets and costumes, imaginative choreography and some impressive performances. And yet, for us, apart from the last act, which we found mesmerising, it didn't quite come off. The point about Frankenstein is the creature and its relationship with Victor. That's what captures the imagination, not the fortunes of the Frankenstein family. As other have said, there needed to be more focus on the creature and the plot needed streamlining. The sets, although marvellous, distracted from and constrained the dancing at times. The last act was the most successful because the set was more symbolic and less naturalistic, the creature was the centre of the action and the pas de deux between Elizabeth and then Victor and the creature were terrifying, awe-inspiring and moving. Stephen Mcrae was outstanding - but he had by far the most interesting part. We also found the monotone emotions of Victor and Elizabeth ultimately a bit irritating; there needed to be more variation in their emotional range and development in their characterisation. As a footnote, I also agree with the comments about the deadening effect of the 'grey' curtains during scene changes - it interrupted the flow.In contrast, we saw The Winter's Tale live at ROH on Saturday - and thought it quite brilliant. Here the choreography, sets and costumes all came together to tell the story in a way that was utterly compelling from start to finish. I think Frankenstein could be a great ballet - but would benefit from some refocusing. I am a sixth form student studying Frankenstein and I was completely astounded by this adaptation of the novel. Liam Scarlett's choreography, amalgamated with incredible scenography and music made it one of the most phenomenal ballet's I have ever seen. The true essence of the novel was captured throughout, and the juxtaposition between the love story and the disturbing elements were perfectly balanced-creating a captivating adaptation of the classic story that is so widely known today. I wish I could see it again! I am extremely saddened that I live so very far away from London, particularly as I have had the privilege of seeing a number of Scarlett pieces. When observing "Frankenstein Insight" on line, even more so. In my opinion, Liam Scarlett is a rare talent, and should be treasured and nurtured! Choreographers are indeed special particularly one of the calibre of Liam Scarlett. The sensitivity he displays when he himself imparts the roles he is working on allows the rest of us to glimpse a fraction of his genius. Do not discourage this young man, he needs your affirmation, critics.